Connie has been playing in the European Women's Individual Amateur Championship this week played at Murhof Golf Club in Austria. From a strong field, some of whom didn't make the cut, Connie shot 71, 71, 70, 71 for a five-under-par 283 and finished Tied 14th...........fantastic! The winner was Spain's Maria Parra Luque on 273. Many congratulations Connie!! In this 54 hole tournament played at Dumpellier over the past 3 days, Louise Duncan opened with a 1 over par 74 to lie in 2nd place. 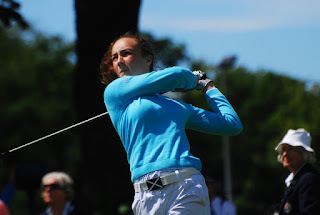 She followed up with 83 and 79 to finish on 236 in 13th position, a very creditable performance from 15 year old Louise. Louise's highlights were 4 birdies in Round 1, 2 in Round 2, and 4 again in Round 3 - good work Louise! 12 year old Rachel Foster had three very consistent rounds, 88, 93, 89 and playing off 17 handicap Rachel has now reduced to 15.5. The highlight of Rachel's round today was an eagle 2 at the 4th hole! Well done Rachel! Hazel MacGarvie retains her place, and Emma Hale gains her first full Cap as both girls are selected for the Scottish Girls' team to play in the Home Internationals at Lanark from 5th - 7th August. Many Congratulations! The re-arranged West of Scotland Championship takes place at Cawder Golf Club on Sunday 13th September. Tee times 12/2.30 - please support this competition. For an entry form click here. Both players had excellent rounds in the Stroke play Championship and, from a field of 83, qualified comfortably in the top 16 for the Match play stages. Alex faced defending champion Alison Bartlett (Royal Dornoch) in the last 16 and only narrowly missed out on the 18th green. 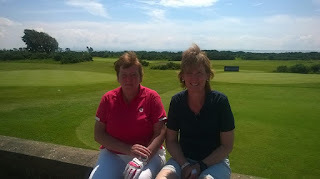 Meanwhile, Vice Captain, Liz advanced to the quarter finals with an excellent win over Fife County Captain Lorna McKinlay (Dunnikier Park) by 5&3. Liz was looking to go one step further than she did at Elgin last year but sadly she missed out on a semi final place losing to Frances Millar (Carnoustie Caledonian) by 5&3 in the afternoon. A great week for both ladies. Well done to Hazel MacGarvie on her performance at the Junior Vagliano Trophy winning 3 out of her 4 matches. Unfortunately the team missed out on winning the Trophy by 10.5 to 7.5 but a great weekend for Hazel.